The pictures above show a box of dry soap from the company Gossages. We presumed it was probably around 1930.The second picture show the direction of using of it. 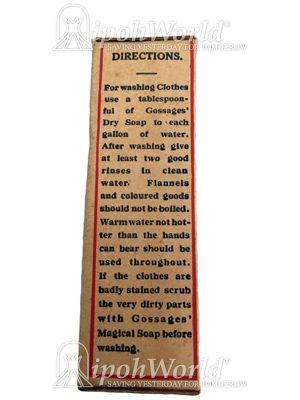 Gossage is a family name of soap makers and alkali manufacturers. Their company eventually became part of the Unilever group. During World War II, all soap brands were abolished by British government decree in 1942, in favour of a generic soap. 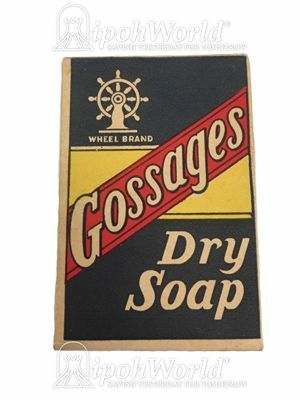 When conditions returned to normal post war, the Gossage brand was not revived by Unilever though the company name is still registered for legal purposes. The online 'Times Index' shows meetings of the Gossage company board until the early 1960s. To know more about the Gossages's products , click the link below.